"When you have a solider of that caliber, you know when he's broken, and when he's broken, he's gotta be fixed." Rarely in life does a book come along that has me telling everyone I know that they have to read it. I just finished Thank You For Your Service, and if you have friends or family returning from military deployment, you may find this book to be an invaluable resource. Yes, there are a number of books on PTSD out there on the market already, but trust me -- you will have never read anything like this one. Mr. Finkel's prior book The Good Soldiers (which I haven't yet read) had him embedded with men in an army battalion in Baghdad during the 2007 surge. Thank You For Your Service finds him embedded yet again, but this time here in the US, after the soldiers' deployments are finished. As the dustjacket blurb states, "He is with them in their most intimate, painful, and hopeful moments" in a period he calls the "after-war," as these men begin the process of trying to recover. The book focuses on soldiers returning with "the invisible wounds of this war, including traumatic brain injury, post-traumatic stress, depression and anxiety," causing emotional, mental and physical scars, often finding their outlet in spousal abuse, alcoholism, drug abuse and sometimes suicide. But it's not just the men -- the author also offers the viewpoints and voices of wives or girlfriends who try to adjust to their men being home but broken. In most cases, the women are simply not equipped to handle the changes and they often wonder what happened to the men they said goodbye to at the start of their deployment. While anything I write can't do the raw power of this book the justice it deserves, you can read my thoughts here at my nonfiction page. 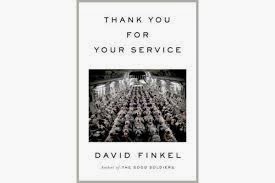 I will say that the soldiers and their families who agreed to participate in Finkel's work did so knowing that everything would be public and on the record, and this openness is what makes this book so haunting. Sometimes I had to put the book down, regroup emotionally, and then come back to it -- and when a book can do this, the author has done an excellent job. Definitely a no-miss read that stay on your mind long after the cover has been closed.